In 2011 I found some "mouth proof" from an ex Games Workshop sculptor about Warcraft being originally a computer version of Warhammer Fantasy. This week, reading the Retro Gamer Magazine issue 111, I would more proof, this time from the other side. 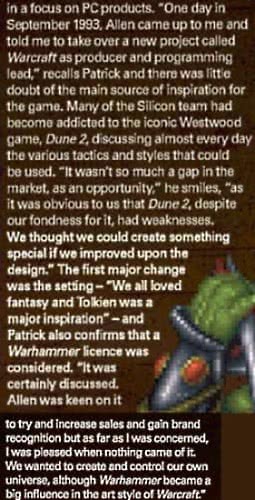 Starting at page 86, there is an interview with Patrick Wyatt about the making of the first Warcraft videogame. Patrick was an ex-Blizzard designer and coder, so we're not talking about gossip but words from one of the game creators. So that more or less settles the "legend" as confirmed. To what extent influenced or why the license was not used we will probably never know, but at least it is not fake.